What I wouldn't give for an afternoon with my mother.As a hard working mother of 6, we didn't get to spend much time together, just the two of us. That changed a bit after I graduated from high school and started college. Every once in a while, we would have an early afternoon with just the two of us. We would sit together and have tea and cookies (Ideal cookies I think, they don't make them any more) and just talk. During those 4 years we became more than mother and daughter. We became friends. She died much too young at 47 only 3 years after I graduated, I missed those precious years because I was overseas and only got home 3 weeks before she died. I have been so lucky with the women in my life. Both of my grandmothers were wonderful ladies. I spent a lot of quality time with them when I was growing up. My mother-in-law was a special lady who gave me the best gift in the world, her son. They are all gone now and dearly missed. I now have 2 daughters with families of their own. Grandsons but no granddaughters yet. There is a baby due in June and I so hope it is a girl. This sounds like a lovely book. Everything I have ever read by Kat Martin has be most enjoyable. I got into all sorts of trouble: but all my mother said was "Well, what are we going to do now? How can we help?" This sounds like a wonderful read. Everything I've ever read by Kat Martin has been very enjoyable. My mother has always been one to take care of her children and now her grandchildren. I remember that when we were sick we would be tucked into bed where we would be brought trays of food and she would insist we rest. The first time I was sick after I lived on my own I was very unhappy to realize there was no one to take care of me. Buffie, great review of what sounds like a very lovely book. Thanks! My mother also died at a very young age of 45. I was 25 at the time and to say I was devastated at this sudden death is an understatement. My Mom and I were just beginning to come together in understanding and of course with my maturity so that we could have conversations. My memories of my Mom include Christmas when she went all out in decorating, cooking and presents. I will share one more anecdote among so many when she hung my bra and underwear on the flagpole at camp. I was just coming of age and was so embarassed and mad but looking back I cherish that memory. Buffie, I'm crying just reading your review, so I know I'll be a mess when I read this book. Thanks for the wonderful, review! The book sounds lovely, Buffie. Like Gannon, I got teary just reading the review. My mother has been dead for more than thirteen years now, but I still miss her and long to share things with her. She started reading to me before I was born, so many of my dearest memories are connected to books. I well remember the summer I was ten and complaining about being bored. Her response was to point me to her books. That summer I read Jane Eyre, Pride and Prejudice, and stacks of contemporary romances by Emilie Loring. I've been reading romance fiction ever since. I'm the youngest of three. Among my favorite memories of Mom are the days we would spend together, while the older siblings were at school and Dad was at work. It was so special to be alone with Mom. I'm lucky to still have her. She is truly a wonderful person. My mother was totally devoted to her family. That was her entire life, being able to love, support and take care of us. Even though her life was hard and she was raised during the depression she was able to entertain of with stories. Her letters and correspondence to friends and relatives was known far and wide. Her frugal nature and her generosity as well. I miss her everyday and wish we could be together but she has been gone for 12 years and is sorely missed. Pat, it sounds like you have been so fortunate with the women in your life. I think that you would really enjoy this book. 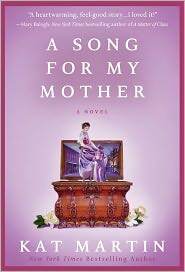 Like I said in my review, this book really touched me as a woman, as a daughter, as a mother. Marybelle, it sounds like your mother gives you time to think about your choices. That is a wise thing! Carol, your mother sounds precious. I love that you remember her hugs the most. Big, tight hugs from a mom are wonderful. My mom does the same thing. This is a wonderful post and I appreciate it greatly. I have learned a lot from my mother and now that it is too late realize her wisdom, kindness, warmth and lessons in living. If there was more time, if we were able to understand things early in life and if we were not immature and cherished every single minute of being with our mothers I would not feel so regretful of many of my actions. She was a loyal friend, kind neighbor and loving parent. The first time I was sick after I lived on my own I was very unhappy to realize there was no one to take care of me. Oh Maureen, I feel the same way. Still to this day I want my Mommy when I'm sick. Thanks, PJ! It is a wonderful book! I will share one more anecdote among so many when she hung my bra and underwear on the flagpole at camp. Pamela, I LOVE this!!! What a great sense of humor! Thanks, Gannon! If you are crying now just wait until you read the book! It is just fabulous. I well remember the summer I was ten and complaining about being bored. Her response was to point me to her books. Janga, so your love of books began with your mother ... that is just wonderful. And what a great gift for her to give you! LSUReader, one on one time is so special. I still enjoy sitting alone with my mom talking and laughing about old times and dreaming of the future. Thanks, Andrea! It is a beautiful book! traveler, your mom sounds fabulous! Your description of her actually reminds me of my Grandmother. Here's a link to the blog I wrote about her and just want a strong woman she was. She was a loyal friend, kind neighbor and loving parent. Petite, your mother sounds just lovely. Buffie, my mother is a pianist--a fine pianist--and some of my best and earliest memories are of lying on the living room floor while she practiced. December evenings spent staring at the Christmas tree while she played. And all the Sunday mornings at church, singing in the choir with Mom next to me on the organ bench. I'm one of the lucky ones--I still have Mom and we're still making music together. Since everyone has shared a little about their own mother, I thought I would too. My mother and I have a very special relationship. Not only is the mother/child love there, but there is such deep love, affection and respect given in both directions. One of my favorite memories is sharing the experience of our first hot air balloon ride over the red rocks in Sedona, Arizona. Many of you have already read my blog about this, but in case you didn't ... here is the link. December evenings spent staring at the Christmas tree while she played. I have to say that the image of a little girl watching the twinkling lights on the Christmas tree while listening to the beautiful music of her mother is just magical. This should really be a scene in a book! My mother was injured when I was eight and it left her crippled but she was one smart lady. I sometimes wish I had listen to her more because the things she told us back then we realize now she was almost always right. My mother has been gone for over twenty years now but I would love to go back in time and just set down with her and drink a cup of coffee and just talk.